You didn’t think we would leave you hanging with just a half marathon training plan, did you? Maybe a full marathon is that bucket list item for you or you have already run multiple marathons – whatever the case – this will become your go-to plan! 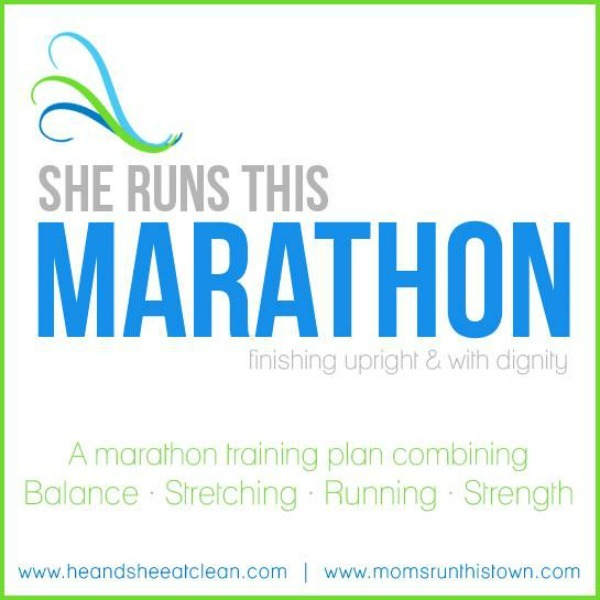 Our She Runs This Marathon plan, created with Moms RUN This Town, is a 16-Week marathon training plan similar to the half marathon training plan that combines strength training including upper body, legs, and core, balance exercises to help you develop strong ankles, stretching geared specifically for runners, and RUNNING! There are HUNDREDS if not thousands of training plans out there and we didn’t want to be like the others, we put a lot of thought into what people hate about training and what people wish they did during training to create this plan! Yes, we will take you up to the full distance you are training for BEFORE the big day – but we do it in a completely unconventional way that will show you that you CAN do it while at the same time using the theory of keeping your legs in motion after you complete a long distance. The strength and balance portions can be done AT HOME with 1-2 sets of weights (more if you want them!). Enjoy the luxury of two short runs followed by a long run each week knowing that all of our “extras” will prepare your body for a strong finish on race day! Not sure if this is the right workout plan for you? Explore our other options here! Have a question? We might have an answer! Check our FAQS here.